The Mercury Dime was a dime issued at the United States mint(s) during the years of 1916 through 1945. Current silver melt value for any mercury dime is $1.08 as the coin is 90% silver. After the Coinage Act of 1890, where Congress passed legislation where the design of U.S. coins could be updated after a coin had been in circulation for 25 years, the dime, quarter and half dollar came up for redesign around 1915. The penny and silver dollar had already been updated and, Adolph A. Weinman won a design competition in 1915 for the design for the new dime. 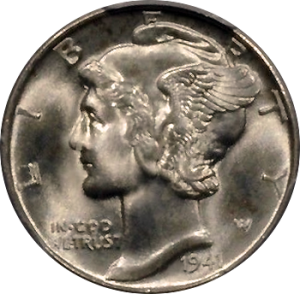 Although it’s official designation is the “Winged Liberty” Dime, with wings on the head of Liberty to signify freedom of thought, the common designation of the winged god Mercury persisted. This lead to most people calling it the “Mercury Dime”. Issued from 1916 through 1945 when it was replaced with the Roosevelt Dime, the Mercury Dime has often been called the most beautiful of American coinage. In adherence to government legislation, the metal content of the Mercury Dime was 90% silver and 10% copper. With a weight of 2.5 grams and a diameter of 17.91 millimeters, the Mercury Dime kept the same specifications as it’s predecessor, the Barber Dime. With over 2 billion Mercury Dimes produced across all mintages and years, it was a highly prolific, yet highly collectable coin, especially as the price of silver rose. Minted in Denver, San Francisco and Philadelphia, the rarest of the Mercury Dimes is the 1916-D of which only 240,000 were produced. This was due to the fact that in that crossover year, most of the dimes produced at the Denver Mint were for the previous Barber design. 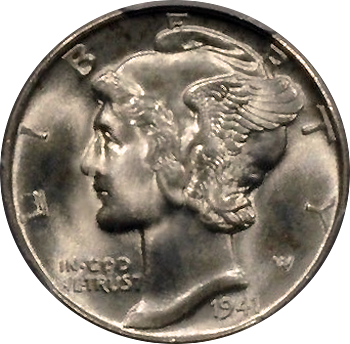 Aside from the 1916-D, the other exceptions to the commonplace valuation for the Mercury Dime are the 1921 and 1921-D as well as the 1942/1 and 1942/1-D overstrikes. With exceptions, common Mercury Dimes in MS66 condition range in the $20 to $50 range and the rare date/overstrike dimes in MS66 condition ranging in the $10,000 to $85,000 range.